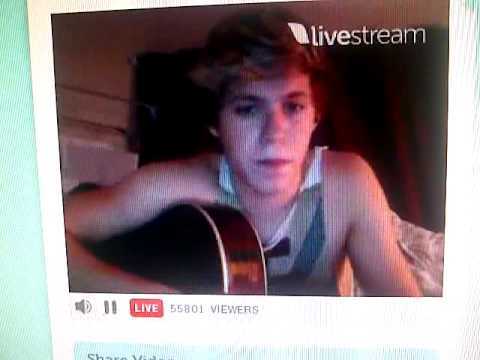 Niall Horan had a special video chat with One Direction fans on Tuesday night as he connected once again with the band's audience to keep up interest of the new single Live While We’re Young. The entertainer had scheduled a special video time for the fans to submit questions on Twitter with Niall responding on video live. While the chat started late (Niall ran into traffic getting home after going to the store,) it was an great opportunity for fans to be close to their favorite boy band member. After answering a few questions, joking around and just having fun with the fans who were watching online the chat ended, but the talking didn't As the star continued to answer questions on Twitter, he reminded everyone just how important they were as One Direction fans. “I love all of you guys soo much! The stuff you do for us is amazing! Keep it up ....best fans on the planet,” tweeted Niall Horan from his official Twitter account. Currently it is the fans who have the new music of One Direction on the top of the charts around the world and the lads from the band couldn't be happier. The special video chats are never media monitored which give fans a direct connection to the stars. Answering as many questions as possible, Niall along with the rest of the stars are able to show appreciation without all the gossip and rumors about One Direction.